When writer Cormac "Mac" O’Neill comes to Bella Vista, Isabel Johansen struggles with her distracting attraction to him while she's planning her sister’s wedding and preparing to open a destination cooking school. After nearly losing Bella Vista, the family’s idyllic hacienda-style home, and discovering a pile of family secrets—including Tess, a half sister she never knew about who wound up saving the estate—Isabel finally has the resources and support to pursue her dream of opening a cooking school. Completely updating her home to house the school and an elegant events venue, she and Tess have decided to launch the space with Tess’ wedding. It’s a busy summer, made even more complicated by the arrival of Mac, a nomadic writer hired to write their grandfather Magnus’ tragic and triumphant story, which includes his work in the Danish resistance during World War II. 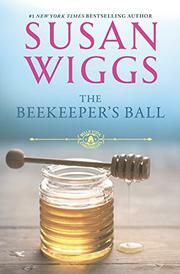 Mix in a young, pregnant beekeeper and an arrogant celebrity chef with whom Isabel shares a dark past, and the book has many satisfying elements, as well as the enchanting setting of Bella Vista, which “lived and breathed with the essence of life.” This novel is best-selling author Wiggs' follows-up to The Apple Orchard (2013), which told Tess' story, and though it's compelling, it never achieves the same level of pitch-perfect authenticity. Isabel remains a domestic goddess, but her reasons for not letting Mac in for most of the book become less understandable the longer she fervently hangs on to them, and her abrupt about-faces in the book's last scenes on so many aspects of her life make us wonder why they weren't so obvious much sooner. A satisfying, engaging read though lacking Wiggs' typical effortlessness and buoyancy.